WHERE CAN I BUY SPARE PARTS AND ACCESSORIES FOR MY BALFA? 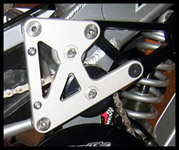 New linkage plates are compatible with all second generation BB7s (2002 and above - see also "Model history"). 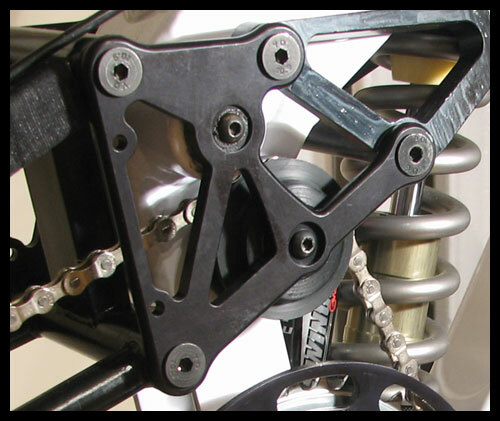 In terms of durability, the roller guiding the chain to the pivot was always the Achilles' heel for Balfa. This part was updated too, so it's a good upgrade. Like every single pivot bike, the BB7 is prone to brake-jack under heavy braking. This means the suspension squats and hardens, so it doesn't use all the travel when you need it (e.g. on braking bumps). Thanks to the high pivot suspension design, it's less of a problem than in other single pivot bikes, but if you want plush suspension every time, it's still a good upgrade. Original floaters are no longer available, so you'll have to make one for your own (I'll try to add some drawings and design notes to help you out) or contact the guys at BrakeTherapy, who are specialist in this field. 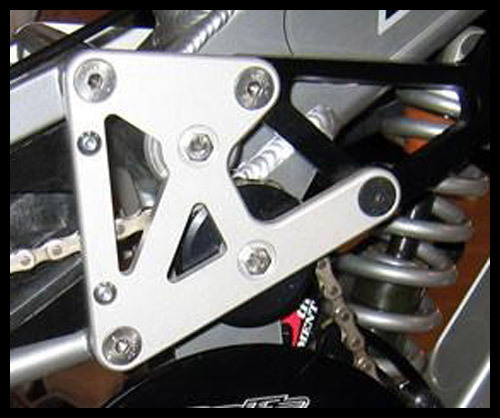 Note that 2003 and newer models have the floater mounting holes integrated to the seat tube, while older models require a floater arm which clamps onto the frame.